Tonkawa secretary, Roy Cook and Jerry Starnes got there early to set up the room for the gathering. We had been Gourd dancing at the San Manuel Pow wow the day before and we had a lot to talk about. TONKAWA Treasurer Vickie Gambala called the meeting to order at 12:30 and chaired the meeting. Cecilia Flores provided the blessing as we all joined hands in a prayer circle for all our Indian Nations peoples. Manuel and Cecilia Flores joined with Jane Dumas at the Cabrillo festival recently and were in some high company at the banquet later that evening. They were glad to be in better health and Cecilia volunteered to assist Nellie Ruiz in calling the members to remind them of the meetings. The next TONKAWA meeting is January 8, 2006. Very tasty, tender beef with potatoes and carrots in an Alfredo sauce, garden fresh green beans, and very tender green beans and chili sauce with sliced jalapenos added to the generous buffet. Rice dishes and chips filled out the extra spaces. Choices of hot coffee and many choices of soda pop lubricated very festive feast. Traditional tribal teasing and good fellowship is one of the qualities that make this one of the most satisfying meetings of the month. The members actively participated in clarifying many of the TONKAWA meeting responsibilities. Discussed at length were the Thanksgiving and Holiday dinners responsibilities and expectations. 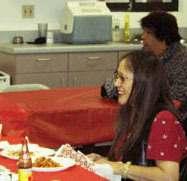 We had an exceptional turnout and we all feel it was in large part to the efforts of our TONKAWA greeter Nellie Ruiz. She called and reminded the members of this meeting. Thank you Nellie! The Secretary recommended that we not have a November or December meeting. 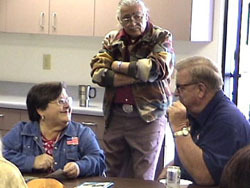 Elections and dues are the priority at the next TONKAWA meeting, January 8, 2006. Until then, we will focus our energy to inviting guests and making these years events a safe and healthy American Indian traditional community experience. Vickie said, It is time for the Indian Council to pick up the ball for the Holiday dinners. She was in a quote me and publish it attitude this weekend since she was interviewed at the Pala diabetes conference by the North county papers. Mary Oyos led the Birthday song for multiple month birthdays! Don Vigneault distributed the gifts. It was a grand time. We all left by 2:30pm with thoughtful opinions, big smiles and memories of a different meeting and some with a nice snack for later too! Maybe we will see you and a friend (We are always recruiting interested members!) 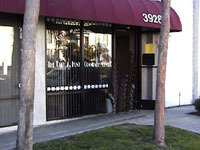 at our next TONKAWA meeting, January 8, 2006, at the Many Nations: Chet Hunt Community room, 3928 Illinois St. San Diego, CA. 92104.